What did you use to “fill in” the area around the fan and light above the shower? I know it’s the walnut siding elsewhere but what is the white right around that? I assume it’s something a bit more waterproof to not be hurt by the steam? It is actually just painted plywood like everywhere else. A primer and a good paint with a higher gloss to deal with the moisture. after 14 months we havnt had any issues and never see condensation or water droplets anywhere, including that location directly above the shower. 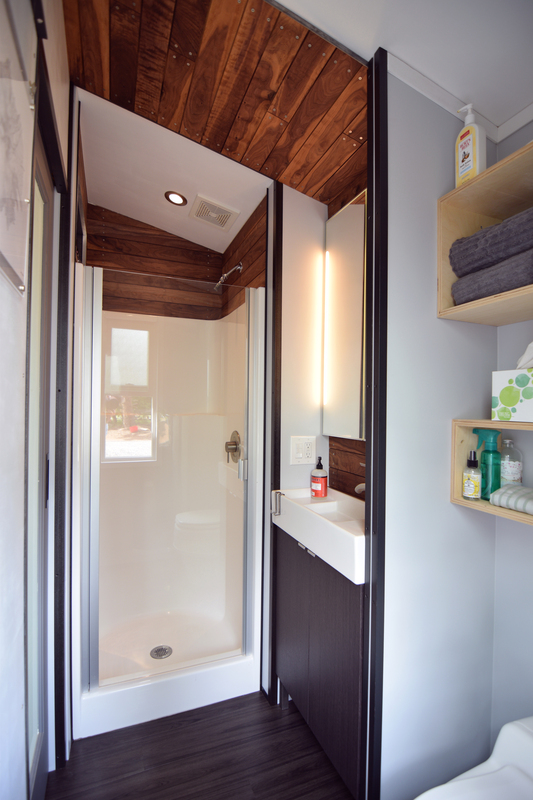 I would attribute it to the location and use of the exhaust fan as well as having normal height ceilings (8′-0″) rather than the +/- 6′-4″ ceilings we see in a lot of tiny house bathrooms that are tucked under a loft.